When it comes to giving back to our local communities, it’s not just large corporations with millions budgeted annually who can make a significant impact on the local community. In fact, studies show small businesses donate 250% more than large businesses to local non-profits and community causes. The best part? 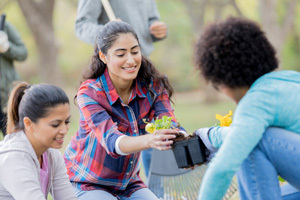 it’s not just the community that’s positively impacted—giving back also has an amazing effect on you, your employees and your business as a whole. Read on to find out why donating just a little bit of company time and money can go a long way toward company success. Numerous studies have found that companies that actively pursue environmental and social outreach efforts had more engaged employees. This is emphasized even further in younger employees—a Pew Research study found that millennials place a higher priority on helping people in need than having a high-paying career. When employees can pick up new skills, engage with the community and come away with a new perspective, it makes giving back worth that much more. In the eyes of many consumers, a company’s philanthropy efforts (and what causes they support) go a long way toward determining their loyalty to your business. Research from a Cone Communications Global CSR study showed that 88% of those surveyed would continue buying products or services if they supported a company’s outreach efforts and 93% would have a more positive image of the company. Not only does helping the community feel good and make employees happy, it’s also an incredibly effective way to shed a positive light on your business. Get in touch with local publications to let them know the next time your business is giving back and make sure to promote your activities on your website, blog, social media and company newsletter. Keep in mind, philanthropy events often lend themselves to networking opportunities as well. Make sure you’re well stocked with business cards and banners or flyers featuring your company name and logo to pass out at events. Nearly every business has a set of core values, but as we know, vocalizing your values and actually doing them are two different things. Being out in the community and making a difference exemplifies what you preach in the office every day and informs the public about your company’s mission, goals and key beliefs. Ongoing outreach efforts not only strengthen your values, but can eventually become a part of your daily operations. There are several responsibilities that come with being a small business owner, and one of those includes doing the best you can to help the local community thrive. The community is also, in many ways, a reflection on your small business. Investing in your community helps boost the local economy, gives a more positive outlook on the community to the public and improves the quality of life for your employees and business neighbors who live in the area.